There are very few components of your hot tub that are easier to take for granted than the filter. There are also very few components that will cause you more trouble if you neglect them. Your hot tub’s filter does more than just strain out debris and the like from your hot tub. It is a vital part of maintaining your tub’s water chemistry, and it also protects your pump from damage. We have put together a small look at Hot Tub Filter Fundamentals the care and cleaning. 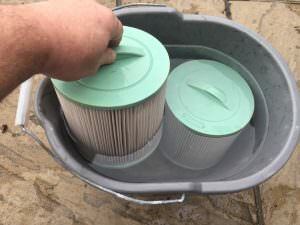 Cleaning the filter properly, at the right time, and replacing it when you should can make for a more enjoyable hot tub experience. It can also save you money in operating costs. A hot tub filter is not a complicated piece of hardware. It consists of a hollow core, two end caps and a ring of pleats, or fins – generally made of polyester. As the water flows through the filter, debris and other contaminants are trapped in the pleats and kept out of the hot tub. 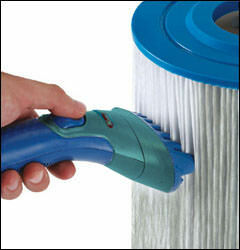 Regardless of how well or how often you clean your filter, you should replace it once a year. If your tub sees a lot of use from a lot of people you might want to replace the hot tub filter more often than that, but the longest you should go is 1 year, no matter what. The main reason for this is that, even if you aren’t using the tub much and there isn’t much to filter out, water is still cycling through the filter and it breaks down over time. This makes it easier for particles and contaminants to get through and into the pump. Pumps are more expensive than filters, so the math is easy replace the filter. As your filter works, it absorbs biological matter from the people who use the tub; body oils, and that sort of thing. It also can develop scale and other mineral deposits which can prevent it from working properly. 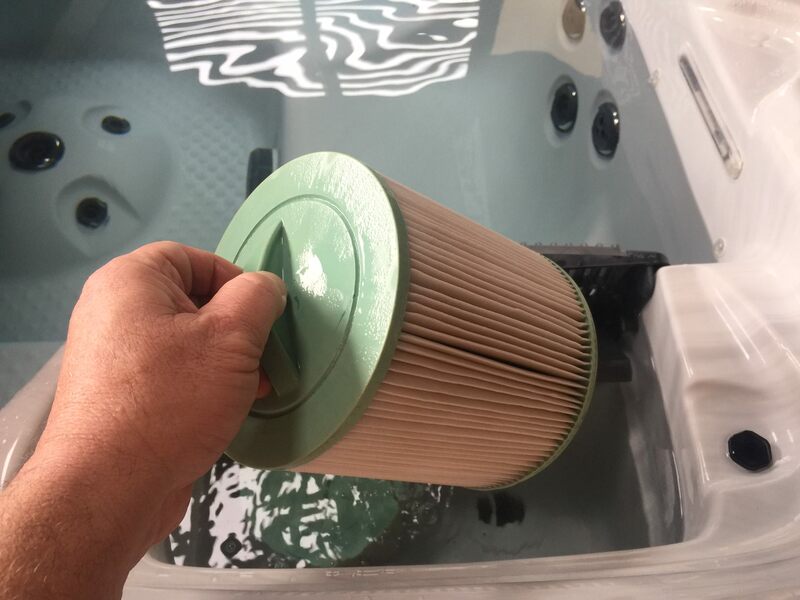 Soaking your filter in a specially formulated hot tub filter cleaning solution helps dissolve these deposits and makes them easier to rinse properly. Please note that you should only use cleaning products specifically designed for hot tub filters on your hot tub filter. Using other cleaning products such as laundry or dish soap will almost certainly result in a foaming hot tub and numerous problems with your water chemistry. Every two weeks or so – more often with heavy use – you should pull out your filter and give it a good rinse. While you can do an almost adequate job with just a garden hose, The Cover Guy recommends purchasing a special hot tub filter cleaning attachment. They thread right onto a standard garden hose and separate the pleats in the filter as they spray them. This makes the filter cleaning process much faster and easier. It also makes it much more effective, which results in less mechanical wear on your tub’s plumbing, and in cleaner water. The cleaner water means your chemicals will be more effective. More effective chemicals mean you use less of them, and that saves you money. Filters are inexpensive and unassuming, but you’d be hard pressed to find a more important part of your hot tub upkeep. Filters are so important to the proper functioning of a hot tub. 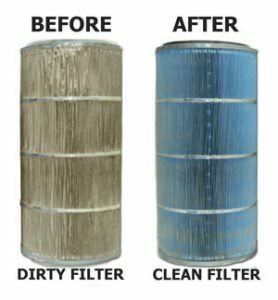 The fact is, that some manufacturers consider a dirty filter to void your warranty. Proper filter maintenance is not difficult, and can save you time and money in the long run. Adhere to the Hot Tub Filter Fundamentals of cleaning and replacing in a timely manner and it will save you and your hot tub in the end.